Today the Barcelona Supercomputing Center (BSC) announced plans to deploy its next-gen ARM prototype cluster for HPC in July. Powered by ARM Cortex-A9, Nvidia Tesla K20 GPUs, and Mellanox QDR InfiniBand, the hybrid supercomputer will be named Pedraforca. By using InfiniBand, Pedraforca enables direct GPU-to-GPU communication through RDMA on ARM. It features a low-power Nvidia Tegra® 3 (4-core Cortex-A9) to run the operating system and drive both the Tesla K20 accelerator and the QDR InfiniBand at the minimum power consumption. Prototypes are critical to accelerate software development, both system software and applications. Pedraforca introduces multiple innovations to the ARM software stack, leading to a more energy-efficient platform for those GPU-centric applications that match the characteristics of the cluster.” says Alex Ramirez, leader of the Heterogeneous Architectures Research Group at BSC. BSC deployed the first ARM-based multicore HPC cluster in October 2011 with a cluster called Tibidabo. 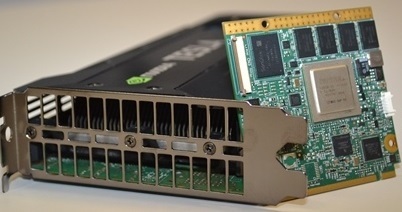 In November 2012, BSC collaborated with NVIDIA and SECO in the development of the KAYLA development platform, the first hybrid ARM + CUDA GPU platform, which was field-tested in the second BSC cluster. Pedraforca represents another step forward in the BSC research roadmap on new technologies and innovative architectures towards energy-efficient HPC.